The Rat King is undoubtedly one of the best Exotic weapons in all of Destiny 2, not just in the base version of the game. In this Destiny 2 Rat King Exotic guide, we'll be walking you through how to get the Rat King in Destiny 2, so you can obtain one of the most powerful hand cannons in the game. If you want other help with the game that isn't to do with getting the Destiny 2 Rat King, head over to our Destiny 2 guide hub. Here, you can find a comprehensive list of every other Exotic weapon in the game, as well as guides to other events like Crucible matches and Strikes. In this guide to the Destiny 2 Rat King, we'll go over what the Rat King is, how you get the Rat King, and give you all the steps you need to actually complete the Rat King quest. It's a long road, but one that's definitely worth it. How Good is the Destiny 2 Exotic, Rat King? The Rat King, an exotic weapon in Destiny 2, seems designed for use in six-player raids. This Kinetic exotic weapon has a damage multiplier that increases for every member of your team who is also using the Rat King. It does seem as though the multiplier only clicks in when your teammates are within a certain distance, but this feature should make the Rat King a favorite during Destiny 2 raids. A handy moment of invisibility when you reload after getting a kill will also be useful. Rat Pack - The Rat King becomes stronger when nearby allies who also have the weapon equipped. Stacks up to six times. Vermin - Reloading Rat King after a kill grants a brief period of invisibility. Now you know a little about the Rat King Exotic in Destiny 2, here’s all the info you need to actually get your hands on it. Follow our step by step guide and the Rat King will be yours. Step 1: Complete the main Destiny 2 story campaign. Completing all the story missions in Destiny 2 will unlock new word quests, including the Enemy of my Enemy quest on Titan. You can see world quests by looking for the new blue markers. Head over to our Homecoming mission walkthrough if you need a hand getting through the story as quickly as possible. Step 2: Complete the Enemy of my Enemy quest to receive the Rat King’s Crew item. While this takes up a Kinetic weapon slot, it isn’t a weapon. Head over to Titan to start the Enemy of my Enemy quest, which shouldn't prove too challenging to any seasoned Guardians. Step 3: Solve the riddles found on the Rat King’s Crew item (check below for the solutions!). Read on for all the solutions to the Rat King Crew riddles/puzzles. In this section of our guide to getting the Rat King exotic weapon in Destiny 2 we’ll list the solutions to the four Rat King riddles. You can also follow the video from YouTube user KackisHD. "The Rat King's Crew runs to and fro, good girls and boys know where to go, pick up your toys and daron your socks, on errands of woe, on errands we walk"
Step 1: Complete the Patrol quest given by Cayde in the European Dead Zone. Step 2: Complete two Patrol missions with one or more guardians in your Fireteam. "The Rat King's Crew goes arm in arm, to fight as one, to do no harm, so have your fun and run outside, rally the flag and we'll never die"
Step 1: Complete two Public events with a fireteam containing at least one other guardian. "The Rat King's Crew goes four and four, with good good fights they learn to score, then three as one they stand upright, return from past the wall and wanting more"
Step 1: Complete two Crucible matches with a Fireteam containing at least one additional guardian. Simple. Don’t worry about choosing between Competitive or Quick Play, as both will work fine. "The Rat King's Crew stands three as one, they see Night's fall and fear it none, but watch the clock as you scale the wall, lest five remain hope comes for none"
Step 1: Tackle the Nightfall - The Arms Dealer Strike. Step 2: Complete the Nightfall - The Arms Dealer Strike with at least five minutes remaining on the clock. In order to finally get your hands on the Rat King in Destiny 2 you'll have to complete the Arms Dealer Nightfall strike with five minutes remaining. That's a tough ask, so we've got some handy Nightfall tips for you. Follow our advice and that Rat King will be yours! Hopefully. Additional time is added to the countdown for every enemy you kill or assist kill. Team up on enemy kills to maximise additional time. You only get 10 minutes to begin with so every additional second is essential. Run past enemies if you can. You don’t need to kill them all if there is a clear and safe route through. Have a build (or at least a squad) that has damage of the Void, Arc and Solar types. A boost to each type rotates during the strike, so it pays to be able to make the most of each. Level your Power Level as high as possible before starting the strike. You'll need to have a Power Level of at least 240, but higher is better. Unfortunately the Arms Dealer Nightfall Strike isn't currently in the Destiny 2 rotation, as the Nightfall Strike changes every week on a Tuesday, although you will get your hands on the Rat King the moment you do complete the Arms Dealer Nightfall with 5 minutes or more remaining. Head over to our Destiny 2 Strike hub, to check when the Arms Dealer Nightfall Strike is back in the rotation. But, since you're going to all this effort to obtain the Rat King Exotic weapon, you probably want to know how it actually plays. We're pleased to report that the Rat King is well worth the time to obtain. 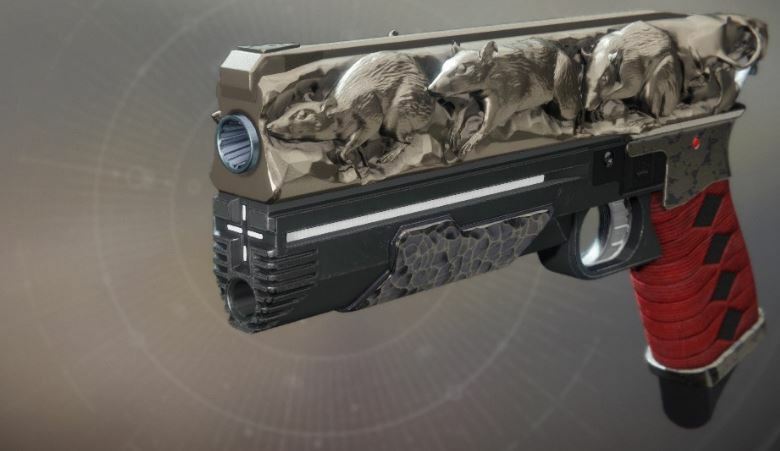 It's got a lethal stopping power, but it doesn't sacrifice accuracy or firing speed for this, as the Rat King can actually fire as fast as you can possibly pull the trigger. On top of this, when you have the Rat King equipped and you're close enough to another player that also has this Exotic weapon equipped, an area on the back end of the Rat King will begin to glow orange, signalling that your damage is being amplified due to two Rat Kings being near one another. This is a really nice aesthetic touch to a weapon that already looks fantastic, and it helps make the Rat King one of the more resognisable weapons in Destiny 2. If you need anything else on Destiny 2 that isn't getting the Rat King, then be sure to check out any of our additional guides here on USgamer, including every Exotic weapon we know of, as well as everything we know about the first Destiny 2 Raid. Hopefully you'll have many months of fun with your new Rat King exotic weapon while you tackle the Destiny 2 raids.